Acclaimed art duo Battenberg-Cartwright shared their experience of working in the fields of art and fashion when they visited the University of Lincoln. Described as a living conceptual piece and performance art duo, Nora and Paul Battenberg-Cartwright have showcased their work on some of the world’s biggest catwalks; including at the London, Berlin and Paris Fashion Weeks. The couple, who married to demonstrate their artistic commitment to one another, work across various artistic disciplines, including lens-based work, performance and painting, as well as fashion design. Battenberg-Cartwright as a label works to extend the bridge between art and fashion, taking used objects to transform them into creations for catwalks. The shows remain between the fashion and art worlds; placing materials as of secondary importance to concept. On Thursday 12th and Friday 13th March 2015, Battenberg-Cartwright presented to the University of Lincoln’s final year Fashion students on their industry success, methods of working and view of art and performance. 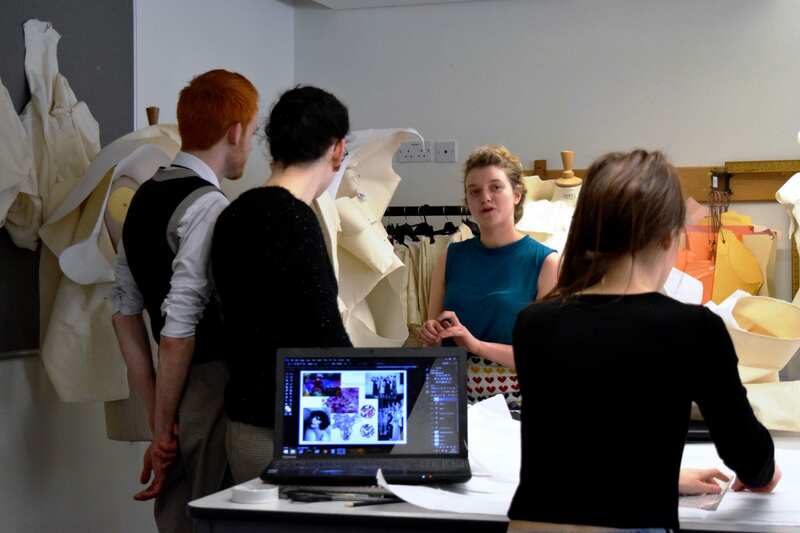 The undergraduate Fashion students from the School of Fine & Performing Arts also discussed their own collections with the artists, and received from them a brief to create an object, wearable or otherwise, to showcase in a video, which will form part of their Professional Practice module. Setting the brief, Battenberg-Cartwright said: “Try not to be so technical. Push your boundaries. Use unusual materials. Make it very quickly – or very slowly if you prefer – but above all things, be daring. Before completing their MA in Fine Art at Chelsea College of Art in London, Battenberg-Cartwright studied Fine Art in Worcester where they were taught by Lee Hassall, who is now a Senior Lecturer in Contemporary Art Practice at the University of Lincoln. To mark the 25th anniversary of Adobe Photoshop, the imaging software that continues to redefine creativity in the digital age, Adobe is showcasing 25 of the most promising visual artists under the age of 25. Designers from around the world have been invited to submit their Photoshop work to Behance using the tag #Ps25Under25, and Tom Watkins, a Creative Advertising student from the University of Lincoln, UK, was selected from a pool of candidates to represent the future of the brand. Tom, who is currently in his second year of undergraduate study at the University of Lincoln’s School of Architecture & Design, has a growing international reputation after winning the coveted Creative Jam at the Adobe Education Summit 2014. From Monday 9th March, he will showcase his work via the Photoshop Instagram account (@Photoshop) for two weeks. From a specially commissioned design created to celebrate Adobe’s landmark anniversary, to images and videos taken while working in and around the University of Lincoln, Tom’s life as a young creative will be presented for the world to see. Tom will be the second designer to present his work as part of the campaign, taking over from Fredy Santiago, a 24-year old Mexican-American artist and illustrator based in Ventura, California. Tom’s work will be showcased on the @Photoshop Instagram channel from Monday 9th March 2015.